The history and agriculture of the peanut are described. The book also describes many foods made from peanuts. When Little Red Hen decides to make a pizza, she discovers she doesn't have the necessary tools and ingredients. So she buys all the ingredients she needs and produces a large enough pizza to feed her friends. 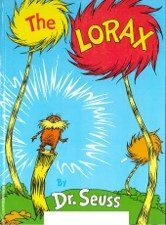 Find out what happens in this Dr. Seuss classic when the Once-ler begins chopping down Truffula Trees to make the wildly popular Thneeds! The results are rather grim but could they have been avoided? Various students count their coins to pay 50 cents for face painting at the school fair. Extra pennies are put in the penny pot for other students to use if needed. The history and a variety of facts about popcorn are described. Different methods of production are included as well. Students will learn how Juan Quezada creates stunningly beautiful clay pots out of natural materials. The text is written in the form of “The House That Jack Built,” but is supplemented by descriptions of the entire pottery making process. The work of Juan Quezada has revitalized the Mexican community of Mata Ortiz from an impoverished town to a prosperous village where a community of artists works to produce traditional pottery. One morning, a boy comes into a town hungry and looking for work. The boy has artistic talent, and a man employs him to paint large, advertising signs. The odd thing is that the signs only say “ArrowStar,” and they are located in the middle of a desert! Why would this be? What is the mystery behind this unusual job? A little girl and her brother felt that mum and dad were no longer the "real" mother and father they used to be when their mum decided to be a science teacher. When their parents really listened to them and found out what they were feeling, they worked it out together as a family. The three little wolves build several houses out of different materials, but the big bad pig uses different tools to destroy each one. Finally, the house they build out of flowers appeals to the pig, and they all live happily ever after. The Tortilla Factory describes, in simple and elegant language, the age-old process of making tortillas - from corn seed to finished product.